This month, we really, really need your help. Despite all attempts to cut back on expenses, as of this writing, we are suffering an increasing net loss. This is partly because of the high cost of electricity and heating oil, but it is primarily caused by reduced donations due to the economy. Thanks to you, we've been independently funded with gifts sent to Nome for more than fifteen years. We've never been rich, but without extra help right now, we face these unpleasant choices. Please pray that people with the means to steady our course will come through, won't you? If you can help in any way or know of someone who can, we and our listeners would be sincerely grateful. Thank you for your faith in us, for your financial support, and especially for your prayers! Incredibly Isolated: Nestled on a steep slope at the base of an island mountain, the village of Little Diomede – seen at left, through the window of a small plane – has one of the most unique and dramatic settings in the world. It faces west to the Bering Strait and to Big Diomede Island, 2.5 miles away, on the eastern fringes of Russia. 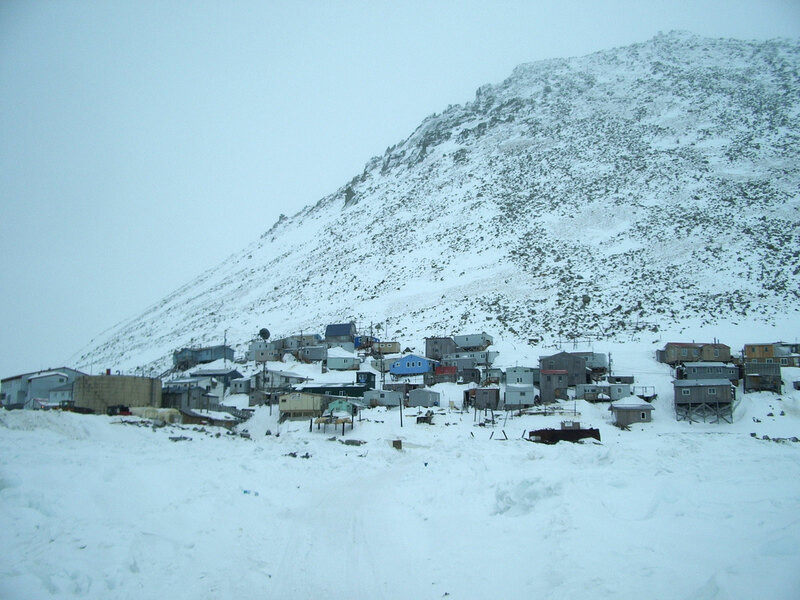 Although Catholic, Little Diomede – often called simply “Diomede” in Western Alaska – may go for a year or more without seeing a priest. Diomede is one place where villagers place a radio on their church’s altar and pray along when KNOM broadcasts the Holy Sacrifice of the Mass. Thank you for making their worship in this very remote nook of the KNOM listening area possible! A diamond is a chunk of coal made good under pressure. 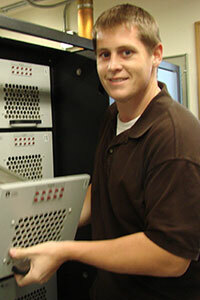 Meet Matty Guiffre, KNOM’s new volunteer production director, in charge of the station’s educational spots. Matty hails from Norwich, a town in upstate New York. He’s a graduate of Niagara University with a major in liberal arts and a concentration in Africana studies. When he was 17, Matty wanted to volunteer and wanted to go to Alaska. 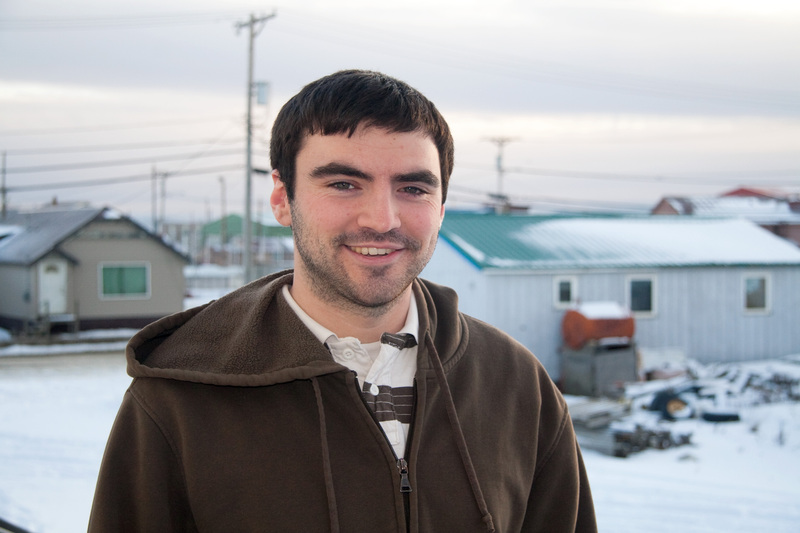 He Googled those two words – “Alaska” and “volunteer” – and there was KNOM. It was meant to be, although he had to wait a few years. As for the coming Nome winter, “I’m shaking in my boots a little. And I’m looking forward to learning to ski.” We know that you join us in welcoming Matty to the KNOM team. Jesus hands over a mission to His disciples. Even with all of their doubts and lack of faith, the disciples are entrusted to proclaim the gospel to every creature. Jesus’ church, in other words, is not a group of strong, confident, courageous believers. Instead, Jesus chooses weak, doubting and scared disciples to form His community of believers. His believers will go on to challenge and defeat those things which destroy human beings. Year-End Giving: Many of our supporters give the KNOM mission stock or other securities at the end of the year. The process is easy. Your broker can electronically transfer them to Raymond James Investments, Inc. The KNOM Radio Mission’s account number is 19865097, DTC Number 0725. Please ask your broker to include your name in delivery instructions. And please also notify KNOM general manager Ric Schmidt at 907-443-5221, as well as Raymond James Financial Services, Inc. branch manager Bob Huston in Anchorage, 907-561-4436, as your information may not appear in our account, and we wish to send you an accurate receipt. Also Meet Matthew Smith, incoming volunteer public affairs director. 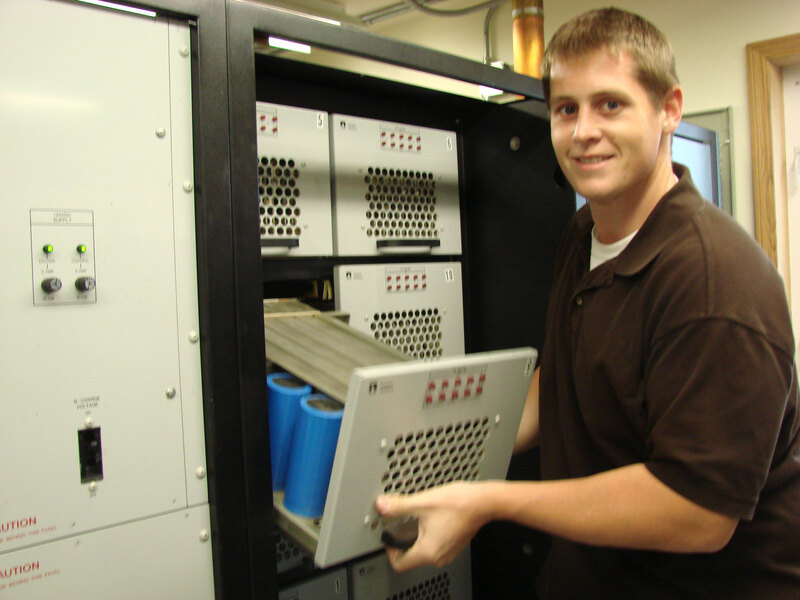 Here, Matthew’s helping with annual maintenance on the heavy power modules in the 25,000 Watt AM transmitter. From Wilmington, Delaware, Matthew graduated from Villanova University, majoring in English and writing with a bit of Chinese. After graduation, he taught English in China for two years in a program coordinated by the Maryknoll order. He was back at Villanova, recruiting volunteers for Maryknoll missions at the university’s volunteer fair, when he met KNOM’s Dave Dodman, who was doing the same thing for KNOM. He was instantly interested and applied. “I jumped at the chance,” Matthew says. 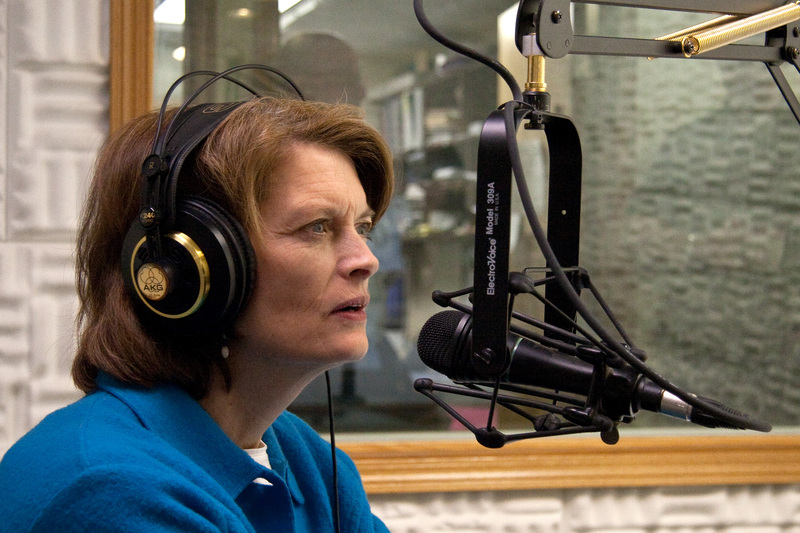 Recently, he helped news director Laureli Kinneen produce a call-in program discussing Alaska Native languages. We all found one call from St. Lawrence Island especially fascinating: the woman explained that in her language, Siberian Yupik, it is impossible to criticize a person behind their back. Again, we know that you join us with a warm welcome for Matthew. Look at a woven basket’s design. They are the fixed bearings that guide the whole rhythm of the weaving. Just like a woven basket, our life must have a fixed bearing: Christ. 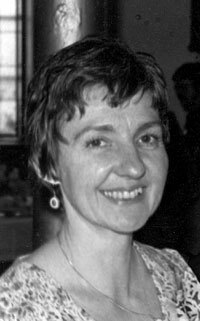 Can you point to any genuine successes in your work over the past 39 years? There are many basic successes. As one small example, when KNOM first signed on, many people in the region did not know the importance of brushing their teeth. We greatly reduced illness by suggesting that people wash their hands after using the honey bucket or after changing a diaper, by instructing families to boil river and creek water before drinking it, and to put a drop of Clorox into dishwater. While we have not ended domestic violence, or alcohol abuse, or gasoline sniffing, they are no longer viewed as normal elements of life, and their incidence is slowly dropping. We can take only part of the credit, though perhaps a large part: The suicide rate in this region prior to KNOM was 20 times the national average. Today, it is still horrible, but only 1/4 what it was then. And, of course, thanks to you, we have brought the Rosary and the Mass into family homes thousands and thousands of times. Thank you! Same Mic, Same Station:Within a week of each other last month, U.S. 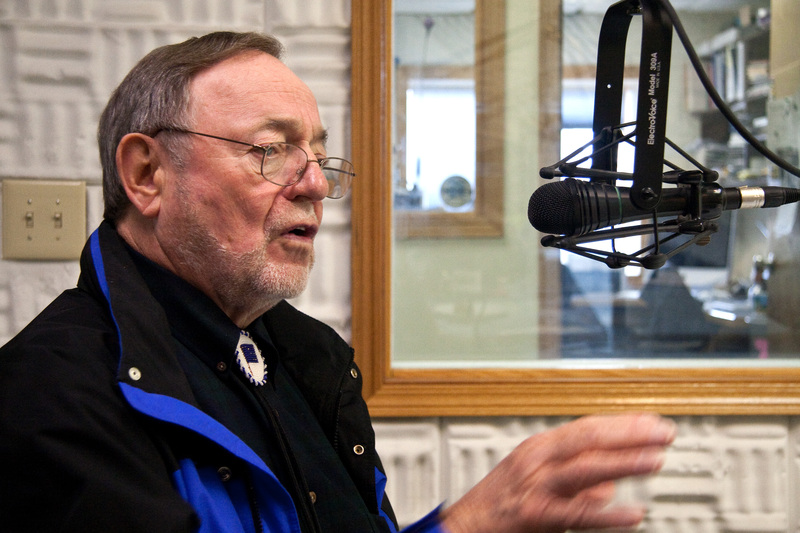 Senator Lisa Murkowski (top left) and U.S. Representative Don Young (bottom left) spoke to the KNOM audience. KNOM is a primary way for Alaska Natives in far-flung villages to learn their elected officials’ positions on vitally important regional issues. FORTY YEARS AGO: In November 1970, with radio construction underway, Therese “Tweet” Burik is back as a volunteer. She serves as business manager and remains at the mission another 15 years. Thirty Years Ago: On November 12, 1980, a major Alaska lands bill passes the US House of Representatives. 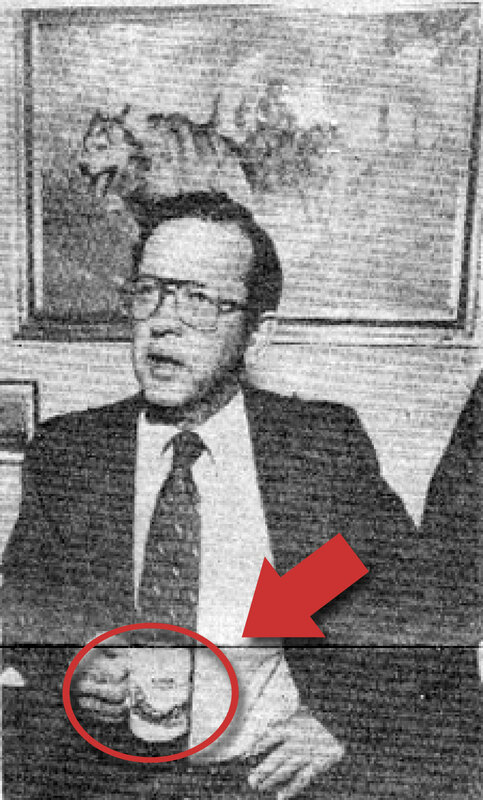 That day, the Associated Press distributes a photo of Alaska Senator Ted Stevens talking with reporters. 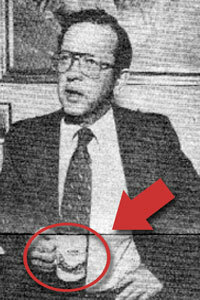 In the picture, Senator Stevens is holding a KNOM coffee mug (picture at left). Never wait for a better time or place to pray. God will hear you wherever you are. A REAL SCARE: Following one of Nome’s power outages this fall, the KNOM emergency generator refused to shut down. It turns out that the main circuit breaker to the transmitter building had burned completely through. It’s possible that vibration from the site’s frequent, relentless wind had slightly loosened one or more of the heavy 470-volt wires connected to it, causing the runaway heating. Electricians, who checked all of our other connections, said that it was a very close call. We were fortunate the entire building did not go up in flames. You can imagine how relieved we were that, except for one destroyed electrical box, everything else was okay. If you are praying for our work, thank you! 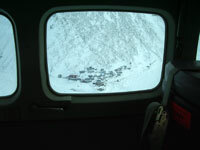 By the time you read this, we may have endured a legendary autumn Bering Sea storm or two. Please continue to pray for everyone’s safety, won’t you? And thank you very, very, very much.